Chinese authorities shut down much of Harbin—a city of more than 10 million people—as unusually high levels of pollution shrouded the city and the surrounding region in mid-October. Measurements taken on October 20, 2013, scored the air quality index (AQI) in the city at 500, the highest possible reading. Levels above 300 are considered hazardous to human health. 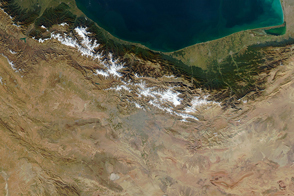 The Moderate Resolution Imaging Spectroradiometer (MODIS) on NASA’s Aqua satellite acquired this natural-color image of northeastern China on October 21, 2013. 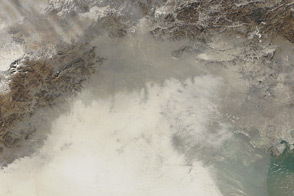 The brightest areas are fog, which has a tinge of gray or yellow due to the air pollution. 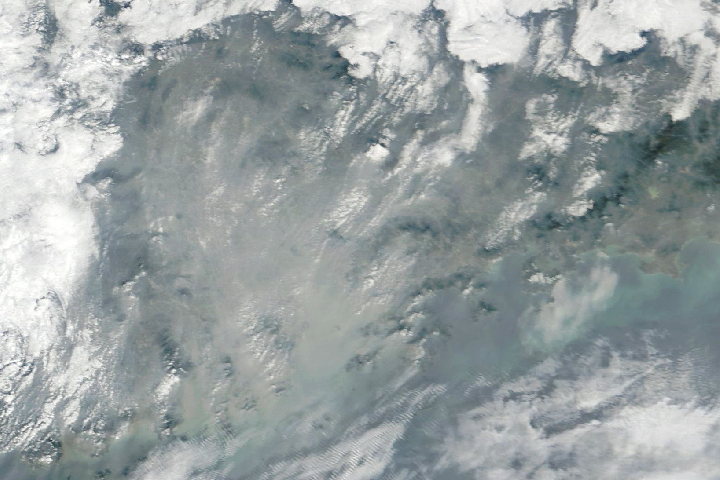 Other cloud-free areas have a pall of gray and brown smog that blots out the city and surrounding towns. Some neighborhoods experienced concentrations of fine particulate matter (PM2.5) as high as 1,000 micrograms per cubic meter. For comparison, the U.S. Environmental Protection Agency’s air quality standards say PM2.5 should remain below 35 micrograms per cubic meter. It is extremely rare for particulate levels to reach that high in the absence of a dust storm or forest fire. Chinese authorities grounded airplanes, shuttered thousands of schools, and closed major roads in response to the surge in pollution. A few days after pollution levels started to rise, Harbin hospitals reported a 30 percent increase in admissions related to respiratory problems, and several Harbin pharmacies were sold out of pollution facemasks, according to media reports. 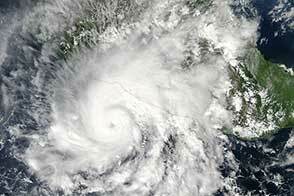 Cold weather and the lack of wind helped fuel the pollution outbreak, but human factors also played an important role. Wheat and corn farmers in the region light fires in the fall to burn off debris following the harvest. Also, city officials turned on Harbin’s city-wide, coal-powered heating system just prior to the pollution outbreak, according to China’s state-run Xinhua News Agency. 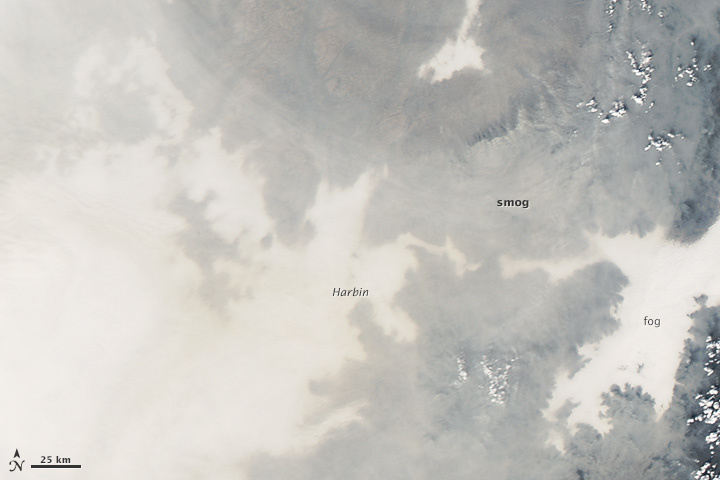 NASA (2010, September 22) New Map Offers a Global View of Health-Sapping Air Pollution. Accessed Accessed October 22, 2013. 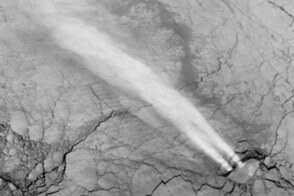 The New York Times (2013, October 21) ‘Airpocalypse’ Hits Harbin, Closing Schools. Accessed October 22, 2013. 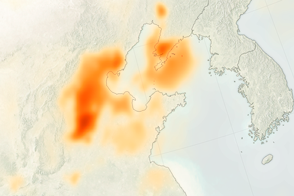 The Washington Post (2013, October 22) Smog paralyzes cities in northeast China. Accessed October 22, 2013. 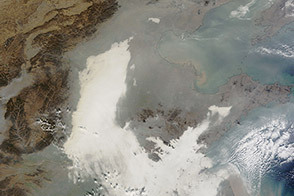 Wall Street Journal (2013, October 22) Heavy Smog Lingers in Northern China. Accessed October 22, 2013. Xinhua New Agency (2013, October 21) Thick smog forces schools, highways to close. Accessed October 22, 2013. 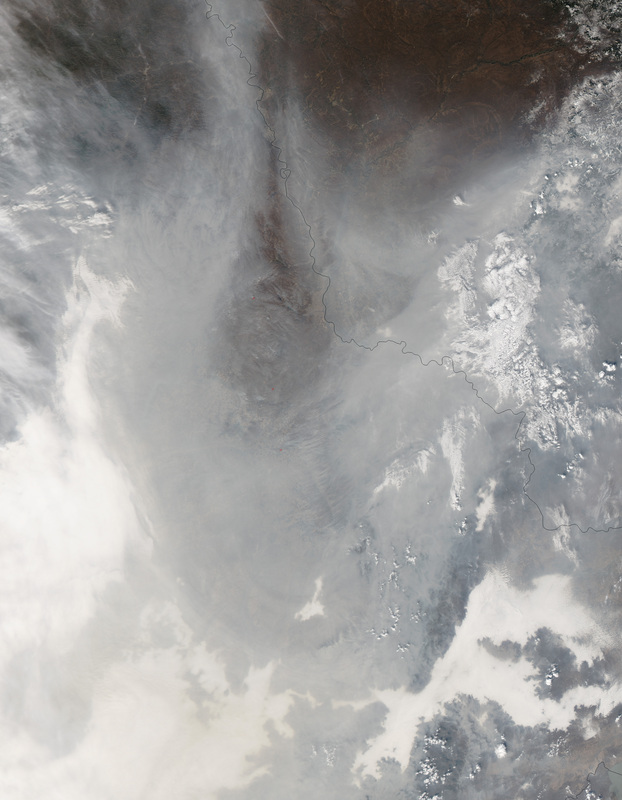 In October 2013, severe smog and haze-filled fog blanketed northeastern China.